Hi, new to the forum here and was looking for notable resources (preferably books) on pre-Colombian southern Californian history. I'm very interested in the customs and traditions of the native peoples, particularly what they ate and how it was obtained. Unfortunately this topic doesn't seem to be well documented so I hope you guys will be able to help me, thanks. Thanks for the links, a lot of good stuff and I've barely touched them. It's complex but I think it's worth studying the "lost" American heritage. That's curious. Today we know a lot more about Native Americans than our ancestors did a century ago. Rather than lossing theirs heritage, the rate of rediscovery is really amazing. For instance, Caral was unkown just a decade ago. And in the states, only recently Kahokia has been reconstructed from zero. In that case I guess I just need to learn to look in the right places and I appreciate the help I've gotten in doing that so far. Have you read "Ishi?" It is about the last wild Indian in California who lived with anthropologist in the 1800's. Sarah Winnemucca also has a good book about the Paiute who lived in E. California and Nevada/Utah. They are not pre-Columbian but I think they have some good information for your research. Penguin, In re: "Today we know a lot more about Native Americans than our ancestors did a century ago." I wouldn't go that far. There have been some important discoveries (v.g., 7000 year old Caucasian remains, the Cacaxtla site, etc). But beyond what the Spanish picked up from their newly conquered peoples, everything earlier is theory. Granted, much of that theory is based upon some first rate archeological studies, and some important developments in deciphering previously "lost" languages, but those theories merely explain what has been found. They can be turned on their head with the next discovery, or evidence that a previously accepted theory was filtered through some politically correct lens to avoid contradicting well established theories. I remember being assured by my guides at Teotihuacan that the peoples there did not practice human sacrifice. Yet an anthropologist who had visited the site told me he had noted "blood runnels" where the blood of victims would have been carried away. Voluminous books on any subject does not necessarily produce an increase in knowledge. And you'd be hard pressed to find any better accounts of the early Aztec and Peruvians that William Prescott's early 19th Century accounts. (The Conquest of Mexico, The Conquest of Peru). The writing style is just harder to read. Well, William Prescott didn't have any clue about Caral or the Chinchorros in Peru. He also missed the desciphering of Mayan writing, from which we can read now accounts written in the 7th century A.D. about political events of those times. He also didn't have a clue about the ancient trade routes that connected by sea Colombia with Mexico along the Pacific coast. Some things will remain in the mystery, of course, but there has been a lot of advances in research. There have been many discoveries and new things appear every year. Well, folks, no dismissal of Prescott as a good writer of English, but anything and everything he had to say on High Amerindian culture was borrowed, sometimes translated verbatim, from Spanish sources be they brief narratives such as that of Las Casas or lengthy works by such as Bernal Diaz del Castillo or Garcilaso de la Vega Inca. Why? Well this New Englander was friends with the three leading hispanicists of his day, George Ticknor, Washington Irving and Henry W. Longfellow, and these gladly led him to the sources. I don't think Prescott would have ever pretended otherwise. For all their alleged faults (which generally brush lightly over any faults of their "victims"), the Spanish were meticulous record keepers. Whether they owe that to the Romans, or to Carlos V's upbringing in Flanders, they did well by it. One wonders how many of today's Ph.Ds in studies touching on High Amerindian culture owe their degrees to documents contained in the Archives of the Indies. It was actually the Spaniards who invaded the Americas (or at least parts of it) not the Amerindians who invaded Spain. But maybe invading other peoples land "brush lightly." What is amazing of the Spanish Chronicles is that they are impartial. Anyone that has studied them will realize that Spanish were brutal, but not genocidal people. In fact, of all the lands conquered by the Spaniards natives survived the best in Spanish America. In the rest, British, French and Dutch simply wiped out the land and killed the navites in mass to replace them with Africans. The Portuguese also enslaved Indians and exploited them to the extinction. However, historians keep fooling around with Spaniards, perhaps because they were honest enough to record the events, meanwhile other simply covered the crimes with dust, and invented wild excuses like the one about wiping out Inidans by "contagious diseases". Genocide, that's what happened! Sorry to rain on this digression, but technically all Homo sapiens are "invaders" on the landscapes of the Western Hemisphere. By the way, Carcharodon, there was no political entity known as Spain in the 15th century nor at any time during the Habsburg dynasty. Coinage at different intervals bore the imprint Rex Hispanorum, but such--which translates as "king of the Spains"--was a numismatic convenience [the doubloons minted in the Americas added et Indianorum: of the Indies]. So dies another travesty of nomenclature fashioned by French and English historiography. Technically, the Indies were an appendage of the Reino de Castilla y Leon and the merchants of this realm were not going to tolerate competitors from other dominions held by their sovereign. I don't know how this could be considered a serious argument. Not that I am a defender of High American culture let alone an indigenist (which I consider racist), but disqualifying people who do because they use documentation created by the Amerindians' oppressors. The Nazis were meticulous record keepers, but it would be absurd to criticize scholars of the Holocaust for using Nazi sources. The Khmer Rouge were also meticulous record keepers. Romania's and East Germany's communist regimes were meticulous record keepers. Paraguay's Stroessner regime was a meticulous record keeper. Are you suggesting anybody studying these regimes do not use data collected by them? Sorry to rain on this digression, but technically all Homo sapiens are "invaders" on the landscapes of the Western Hemisphere. For what itÂ´s worth, itÂ´s a difference between the first immigrants that came over the Bering straits maybe 15 000 years ago and spread over the land and the Europeans that came much, much later and many times used force to expel and replace people who already lived there. By the way, Carcharodon, there was no political entity known as Spain in the 15th century nor at any time during the Habsburg dynasty. Coinage at different intervals bore the imprint Rex Hispanorum, but such--which translates as "king of the Spains"--was a numismatic convenience [the doubloons minted in the Americas added et Indianorum: of the Indies]. So dies another travesty of nomenclature fashioned by French and English historiography. Technically, the Indies were an appendage of the Reino de Castilla y Leon and the merchants of this realm were not going to tolerate competitors from other dominions held by their sovereign. What you actually will call the Spaniards at that time is more about semantics, it doesnÂ´t change the fact that they went over to the Americas and invaded other peoles territory. But the worst colonial regimes in the Americas were the British, French and Portuguese, in that order, and the Americans didn't do better when they broke "free". And those guys forgot everything. In fact Hitler himself got inspired in the Conquist of the West, only that he send his hordes in to oposite direction: to the East. Mixcoatl, If you read my post carefully, you'll see that I have a very high respect for the Archives of the Indies, and those who wrote the various studies and accounts that went into those archives. The Spanish had great respect for the peoples they conquered, and it showed in their writings. Even the turgidly difficult "Historia de la Nueva Mexico" by "Capitan" Gaspar de Villagra, written (poorly) in the form of an epic poem, contained a wealth of details on the Aztec origins, and Juan de Onate's expedition to what is today New Mexico. Indeed, you can find the names of virtually every old family in New Mexico by reference to their progenitor. Pinguino and Carcharodon, If you keep dredging up polemics, we will simply see again the tired old arguments we've seen in so many other threads. drgonzaga make his point well. There was probably not a single people in the americas at the time of the Conquest, except perhaps in the Amazon and out on the Pampa, who had not taken their territory by conquest. Pinguino, you might find the "Atlas Historico de Mesoamerica" compiled by Linda Manzanilla and Leonardo Lopez Lujan of some interest. Published by Larousse (Referencias Larousse), it gives a very brief overview of the Americas prior to the conquest. Of note, it the constant mentioning of peoples who have been conquered, or have conquered. Both of you keep missing the point on North America, that part of the continent that nobody wanted because the Indians were not "civilized", as were the mesoamericans, Chibcha. and Peruvians. It was not a conquest. It was a process of accretion. More Europeans kept arriving, and the Indigenous population kept falling. It was a process of dislocation. The Great Plains were "conquered" by Swedish, Norwegian, and German immigrants who moved into empty lands and put up fences. The Buffalo, already seriously impacted by the railroads, were nearly exterminated. With that, the days of the Great Plains tribes were over. More than any military campaigns, that was what settled the future of the plains tribes. Their real problem was that their total population as a semi-nomadic people following the buffalo, could never match that of an emerging industrial and agricultural giant. Hey, people, why sell the Amerind short? They, no less than any "Spaniard", were just as adept at "invading" other peoples "territory". And with regard to these "nasty" Spaniards, we would need an example of "expell[ing] and replac[ing'" anyone! In fact in the Spanish archives at Seville there are nifty land grants to Amerind communities [e.g. the Tiguas, who were not despoiled until the arrival of the "gringo" in the 1850s] including a rather handsome 1795 grant in East Texas to Amerind refugees (the Alabama-Coushatta) from the despoilation visited on them by the young U. S. Republic. Of course, we could also argue, as some do, that Caucasians were the first to reach the Americas, but that these Atlantic crossers were exterminated by the later Amerinds...just showing how crazy caricaturing the past can get, folks! One can really go over the top by bringing in the Nazis. For heaven's sake people get a grip. Well, Nazis didn't appear on thin air, they loved cowboy movies. Actually, they got inspired by seen Class-B Indian movies of the 30s, even before John Wayne cover the screen with so much Indian blood. If Americans could kill 30.000 Indians in each movie drama, Nazis though they could exterminate 20 million Russians in a boring east campain. ...Both of you keep missing the point on North America, that part of the continent that nobody wanted because the Indians were not "civilized", as were the mesoamericans, Chibcha. and Peruvians. It was not a conquest. Nomadic Indians didn't have the concept of "personal" property, but they have the idea of communitary ownership. They fought wars to define territories from intruders for thousand of years, before the Europeans arrived. When the Europeans started to exterminate Buffalo, do you believe they though that was fine? It was a process of accretion. More Europeans kept arriving, and the Indigenous population kept falling. It was a process of dislocation. The Great Plains were "conquered" by Swedish, Norwegian, and German immigrants who moved into empty lands and put up fences. The Buffalo, already seriously impacted by the railroads, were nearly exterminated. With that, the days of the Great Plains tribes were over. More than any military campaigns, that was what settled the future of the plains tribes. Their real problem was that their total population as a semi-nomadic people following the buffalo, could never match that of an emerging industrial and agricultural giant. Well, that's true. In North America the Amerindians where flooded with large populations of Europeans. But outsiders have the right of doing that? Of course not. Of course nomadic people couldn't match the firepower of modern rifles, but we are arguing if it is right to use the force to steal the land from theirs legitimate owners. That's all. Pinguino and Carcharodon, If you keep dredging up polemics, we will simply see again the tired old arguments we've seen in so many other threads. drgonzaga make his point well. There was probably not a single people in the americas at the time of the Conquest, except perhaps in the Amazon and out on the Pampa, who had not taken their territory by conquest. ItÂ´s like saying that it was not wrong of Hitler to invade Belgium since Belgium (for a while King Leopold and later the Belgian state) had a colony in Kongo where gruesome acts occured. Just too many movies under your belt for that one, P, or just simple unfamiliarity with the time and nature of Caddoan "settlement" onto the Great Plain after AD 1200 or the transformative nature of the Spanish horse after 1550. But as with Carcharodon the need to render moral judgments on the distant past says far too little on the mind sets of either the Europeans or the Amerind, and just too much on the current nervousness called political correctness. Might as well speak of those nasty Mongols and the poor Slavish peasants of the Steppes. By the way, anyone care for some European shank, properly seasoned and broiled on a boucan. 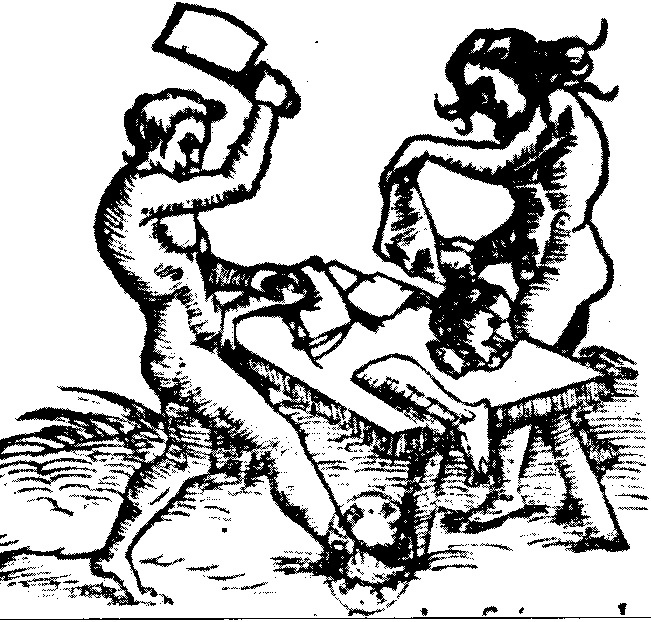 This is but another variation of the old Protestant cannard on the vile catholic Spaniards and those benevolent and enlightened Calvinists, who understood the disestablished Amerind... that was before they fully "joined the game" and gave us a different summation: the howling, contorted, blade-wielding baby-killers ubiquitous in Anglo-French colonialist propaganda. Nobody deny there were some canibbals among Amerindians, and also some head hunter tribes. People was rude at that time, you know? In Germany protestants were burning 100.000 crazy old women... I mean witches... to preserve the world saint and pure. But the real state of the Americas was stealed by Europeans, and that's the point. That's why natives like Sioux or Mapuches don't call Europeans killers or murderers at all; they call them names all of which mean robbers. You've missed the actual point, Pinguin. What purpose with all this finger pointing? It tells us nothing of the past and even less of contemporary Amerinds, who confront entirely different problems today. As for the name calling, Sioux is an Ojibwa word meaning "snake" or "enemy". The Tewa gave their rivals the name, Navajo, and that little word stands for "thieves" or "takers of the fields". As all anthropologists know a common characteristic of Amerind groups is the "we the real people" address [that is only the immediate group holds humanity, all others are "enemies" or even more denigrative appellations]. The Navajo, who identified themselves as "real people" or the Dine coined the term Anasazi which really means "ancient enemies" for the ancestral Pueblos. So whatever you might think along these lines, "dehumanizing" the opponent or rival has a very old tradition among all "people". Imagine if someone on the Altiplano began an agitation against those Chilean robbers of the Atacama--if your conscience twitches about all of this land robbery let us hold forth on Tacna and Arica. Maybe finger pointing has no real meaning but still one just have to admit the fact that Europeans invaded other peoples land. Then one can always discuss which European nation was worst in that endeavour or which methods were used, or what the speed or chronology of the process (or processes) where. When adressing such topic it is rather irrelevant what the Amerinds called themselves or called each other. To adress those things in this particular context is just a smoke screen. Sniping will get you nowhere, Carcharodon, not even from GÃ¶taland to Gotland on a ferry. And before you go Oz on me, just accept the facts in both anthropology and history with regard to the geographical mobility of peoples prior to the issuance of pasports! Obviously, you entirely miss the significance of dehumanization in group conflict. The Amerind was no different than his European counterpart in this regard and, in all honesty, your efforts with the victimization angle actually demeans the Amerind. The truly irrelevant theme is all of this catawauling over "invasion" and other tired words that truly say nothing of a historical period. Conflict was an essential element in the daily life of the Amerind, just as it was in that of the European, and the truly pertinent issues are the methods of resolution to the underlying problems: integration or dismissal and isolation. In the same sense, the word "Invasion" is the most appropiated for what happened in the Americas. And "robbers of lands" is appropiated as well for all the people that arrived here to appropiate of these lands. In fact, Mapuches call us "huincas" (pronounced "wincas"), which mean exactly like that... and we know it is true. That was a war among states. When the U.S. return the South West to Mexico we are going to return the northern provinces to Peru and Bolivia. Not earlier. To discuss Native Americans conflicts with each other is not especially relevant since the taking of their land was still an (or several) invasion. The European incursions will not be morally justified just because the native populations engaged in conflicts, like most other people on earth has done now and then. ItÂ´s not about victimizing anyone, itÂ´s just about calling things with their right names. Exactly. It is extremely important to call the things with the right names. A crime is a crime, and an invasion a invasion. Just remember I am goint to quote you in another discusion. Ah, seeking shelter under the beard of Uncle Sam are we now? I suppose a "war among states" makes everything all to the good-and-well, but I'd hate to apply that logic and follow it to a conclusion with regard to the Amerind! At least, the 16th century Spaniard had greater consistency as well as respect with regard to the intelligence of the Amerind from a juridical perspective. Perhaps a reading of the Requerimiento is in order. Mapuches are my Amerindians, Bolivians are citizens of another republic. One that fooled around with us and found the Mapuche warrior tradition falling on theirs heads. "To discuss Native Americans conflicts with each other is not especially relevant since the taking of their land was still an (or several) invasion. The European incursions will not be morally justified just because the native populations engaged in conflicts, like most other people on earth has done now and then. ItÂ´s not about victimizing anyone, itÂ´s just about calling things with their right names." A casual remark in one of the accounts of Cortez's conquest - I no longer can tell where I saw it- suggested an answer to such questions, and my new hypothesis gathered plausibility and significance as I mulled it over and reflected on its implications afterward. For on the night when the Aztecs drove Cortez and his men out of Mexico City, killing many of them, an epidemic of smallpox was raging in the city. The man who had organized the assault on the Spaniards was among those who died on that noche trista, as the Spaniards later called it. The paralyzing effect of a lethal epidemic goes far to explain why the Aztecs did not pursue the defeated and demoralized Spaniards, giving them time and opportunity to rest and regroup, gather Indian allies and set siege to the city, and so achieve their eventual victory. http://info.med.yale.edu/therarad/summers/mcneill.htm - adaptation of European foods, technology, and culture. As an irony of history, Evo Morales of Bolivia is attempting to restore the juridical authority once held by the Aymaran community leaders of the Altiplano during the colonial epoch! What I meant was regardless if Native Americans had fought each others since eternity Europeans had no right to go there in the first place and start to interfere in their lives and cultures. That the Europeans after their arrival started to meddle in the internal affairs of the indigenous and started to play the game of divide and conquer is another matter. It seems that this discussion has strayed far away from the original topic of this thread. Absolutely. They had no right. But "rights" have never stopped people. All it can be done today is just to remember these events were an invasion, and not a wonderful "discovery". Absolutely. They had no right. But "rights" have neverÂ stopped people. Â All it can be done today is just to remember these events were an invasion, and not a wonderful "discovery". Calling the arrival of Europeans to the Americas an invasion or discovery is a matter of perspective. Â Few Europeans knew of the Americas so from their perspective it is a discovery of a new land. Â In short you can call it either a discovery or an invasion. An investigation of the thread using the methodology of History can only lead to this conclusion on the above utterance: Methinks the Carch doth protest too much! To paraphrase popular culture: Rights! We don't need no stinking rights! But, Pinguin, you forget that the Spanish were legalists to the extreme, and the juridical roots sustaining the colonization of the New World would deaden even the most intense scholastic. Of greater importance, however, is that the advent of the Spanish on the shores of the Mundus Novus, and such was the European conception as early as 1501, did lay the foundations of International Law and the capacity to speak of "rights' in any juridical manner at all. As I have growm tired of repeating the verbiage of the 21st century does nothing but obscure and misrepresent the actual ideas and conceptions of the past in their maturation toward modernity. Wow this thread really took off. I didn't get a chance to read all the posts and will come back to them later, but for now I'd like to throw in my two cents. First off, in a historic sense I am completely ignorant and my interest in the Native Americans comes more from an environmental perspective. Rather than speculate on what historically happened [since many arguments can be drawn from that process (as is shown in this thread) without any conclusive knowledge being gained. " They can be turned on their head with the next discovery, or evidence that a previously accepted theory was filtered through some politically correct lens to avoid contradicting well established theories." - lirelou], I want to learn about the native peoples' traditions since that is how much cultural knowledge is passed on. That's why I feel sources from Native Americans themselves or people who have had close relationships with them are particularly valuable (thanks for your suggestions eaglecap). One very good point brought up was that Native Americans had no perception of personal ownership of the land, which is what I believe allowed them to survive for so long. I too believe that it isn't worth figuring out who's fault is who's, but I do know that Native Americans (and many cultures around the world) have been able to live sustainably off the land for thousands of years, but in the span of a few hundreds years of Western influence many resources have become scarce and much of the local flora and fauna have been devastated. That's what I intially meant by "lost heritage" and I'm trying to get some of that precious commodity back. On more of an opinion basis, I don't think it's fair to compare European conquest with inter-tribal confilicts. Tribal conflicts were born out of neccessity and there was nothing necessary about the totality of what the Europeans accomplished, unless you look at it from a religious view. I saw a historical documentary on tv where one tribe had joined forces with Europeans in order to defeat their rivals, but once the fighting commenced the natives began to yell "No more!" in reaction to the European brutality because the idea of genocide was so alien to them (sorry about the layman's terminology). Now I'm not trying to paint the Amerindians as some divine race, that's just unrealistic, but there does seem to be some sense of respectful restraint in indigenous culture and that wisdom is also passed on through tradition. I concede that what I know or how I interpreted it could have been influenced by my goals, but I'm learning as I go. Anyways, if there are any more resources out there I'd appreciate them. Also, in no way am I trying to downplay history. I was just emphasizing that it wasn't my focus and I'll leave you guys to your debate. Well, the problem is that not all native americans were tribal people at all. In the Americas there were nomades, farmers, large societies and even empires half the size of the Roman Empire. Believing all the Indians have the same mentality, and all have the same phylosophy is really nonsense. Even from the ecologist point of view there are many contradiction. It is well known the entrance of humans to the New World devasted the fauna. It is also well known that ecological crisis afected the Anazasis, the Moche, the Mayans and many other cultures. There was even industrial polution at that time. So, it is not western phylosophy versus native what we are talking about here. It is simply the fact Europeans invaded the New World, without ANY right to do so. As simple as that. Applebuilder, in re: "One very good point brought up was that Native Americans had no perception of personal ownership of the land, which is what I believe allowed them to survive for so long." That must be qualified. They certainly had a clear concept of private property, i.e. horses, weapons, tools, clothing, ceremonial regalia, etc. They also had clear concepts of communal property, both clan and tribal. They also had concepts of shared areas between clans and tribes, such as hunting grounds that some could use, and others could not. So "no perception of personal ownership of the land" in only correct in the individual private ownership sense. As to: "but once the fighting commenced the natives began to yell "No more!" in reaction to the European brutality because the idea of genocide was so alien to them." You may be reading too much into that. Tribes did fight wars of annihilation against weak neighbors. Look at the history of the Delaware tribe, who came close to annihilation at the hands of their enemies. Pinguino, always the same old drum beat. The Europeans had as much right to immigrate to America as the pre-historic North Asians/Siberians did. Or, do you have a copy of "Adam's Will" containing a clause that says otherwise? lirelou: Pinguino, always the same old drum beat. The Europeans had as much right to immigrate to America as the pre-historic North Asians/Siberians did. Or, do you have a copy of "Adam's Will" containing a clause that says otherwise? It was a rather different situation. When the first North Asians/Siberians arrived there were no other peoples living there. When the Europeans came to America there were already people living there, people whoÂ´s land the Europeans in different manners invaded, infiltrated, expropriated and in other ways gained access to. Hey folks, let us agree that this bit over "invaders and invasions" is so archaic as to be hoary and developing cobwebs, specially with respect to a rather novel concept moved forth under current International Law--the freedom to emigrate. Is anyone familiar with the recent to do over "early points" on the Atlantic litoral and their similarity with those on the opposing European shore? I know, I know, been there done that so on and so forth, but give us a break and let's cease all of this one-upsmanship over political correctness. Whatever may have bothered the conscience of the 16th century was absolved by Francisco de Victoria and The Rights of War. Inasmuch as the seizure and occupation of those lands of the barbarians whom we style Indians can best, it seems, be defended under the law of war, I propose to supplement the foregoing discussion of the titles, some just and some unjust, which the Spaniards may allege for their hold on the lands in question, by a short discussion of the law of war, so as to give more completeness to that relectio. As, however, the other claims on my time will not allow me to deal with all the points which arise out of this topic, the scope which I can give my pen must be proportionate, not to the amplitude and dignity of the theme, but to the shortness of the time at my disposal. And so I will merely note the main propositions of this topic, together with very brief proofs, and will abstain from touching on the many doubtful matters which might otherwise be brought into this discussion. I will deal with four principal questions. First, Whether Christians may make war at all; secondly, Where does the authority to declare or wage war repose; thirdly, What may and ought to furnish causes of just war; fourthly, What and how extensive measures may be taken in a just war against the enemy? Europeans robbed the Indian lands. It amazes me modern and decent people has so much trouble to recognize something so obvious. Give it a rest, Pinguin, or at least choose another adjective...it's not anyone's fault your "victims" failed to carry homeowner's insurance! Governments take other peoples lands all the time under the principles of eminent domain and best use. Now where is a Mastodon going to find a good tort lawyer!?! Anyway if you are so guilt struck about it, why not take a Mapuche out to dinner? Sorry for the levity but all of your protests are irrelevant to the 16th century except when intertwined with and in terms of how the Europeans justified such actions in terms of their own morality. Hence my reference to Victoria. Maybe they just donÂ´t want to admit that some of their ancestors may have been among those who stole other peoples land. But those who have such ancestors just have to learn to face up to it like many other peoples round the world have to face up to their history. While living under the military regime of Pinochet I discover how important the right adjectives are. You know, the gorillas didn't like to talk about a military coup (golpe). They preffered to call it a "military declaration" (pronunciamiento militar). Well, while they were in power, nobody spoke about "coups" in Chile. It was just a "declaration". When democracy return and the criminals started to be sent to jail, people finally named it like it was: A COUP. I know centuries could pass., but finally the world and the official historians will use the right terms to talk about the INVASION of the Americas and the Robbery of the lands. Anyway if you are so guilt struck about, why not take a Mapuche out to dinner? No matter most of my relatives and ancestors are of Iberian origins, I do have Mapuche friends, co-workers and students. Some of my in-laws are of that origin as well. Even more, I am studying Mapudungun. So, please, restrain yourself of using such a bad taste sense of humor. OK? Actually the good Doctor has a nice way with words and at least I find his humor spot on. Pinguino (new nic and I like that too) he is simply reminding us not to get too carried away with redundant assertions and that the occasional use of levity acts as a good counterbalance to those who need a refreshing dose of sanity. My two cents. As I have tired of iterating, you can not make moral judgments on the past in terms of contemporary exigencies and understanding for in doing so one learns nothing of that past nor how and why the present is different. You can certainly affirm the negative aspects of the process within Modern Thought but the moral history of the past few generations, so entwined with relativism, can hardly sustain such an effort without being heavily charged with hypocrisy. I am sorry you did not grasp my ironic humour, but in response you provided one of the classic gotchas--"why some of my best friends are..."--, which should serve as a warning on the dangers of forcing the language of the present onto the past. Since you raised the narrative on the immediate past of Chile, I will respond directly elsewhere as to why such is the classic example of what I am talking about. If you can't make moral judgments of the past, then why to judge Nazis and the hollocaust? Why to judge the Vietnam war? Hiroshima? Nope. There you are absolutelly wrong. One of the tasks of history is preciselly to evaluate history. That's to judge it. It is of historical interest that rather than employing the classic terminology of the "golpe de estado" (the Napoleonic coup d'etat), the Chilean military turned to early revolutionary Spain and the Grito de Riego, which coined the term Pronunciamiento Militar, whose intent was to shape government as a projection of the national will through the support of political forces and public opinion [no matter how hard one tries it is hard to escape the mind set of 19th century Liberalism within the Chilean military as an institution]. Such certainly brings forth a reason as to why the 1980 Constitution continued to haunt Chile. The Pronunciamiento did not materialize out of thin air, however, and can be viewed as the formal response of the military as an institution to the call for the restoration of order made by the Chilean Chamber of Deputies on 22 August 1973 to the military ministers of the government to secure "la orden constitucional"! To blame all on Pinochet is to turn a blind eye to the actual historical and social forces in tension within Chile and its institutions. Similarly, to call the advent of the European onto the Western Hemisphere, an invasion and an act of robbery, says nothing of the forces and institution at play nor can explain the true roots of American hemispheric identity. It may make some feel good but such verbiage carries nothing of relevance, specially if one wishes to understand the distinct differences in the societies that now constitute the Americas. In his day the majority of Europeans looked upon Napoleon much as the middle of the 20th century looked upon Hitler...but I would not advise that you rush into Les Invalides to spit on Napoleon's tomb! Besides, there is quite a difference between evaluating and judging, the latter is as transitory as life itself. Today's judgments may quickly become tomorrow's foolishness. The horror of Nazism lies not in its crimes, but on just how ordinary its perpetrators were. That is an evaluation and most certainly not a judgment for when one goes searching for monsters, one inevitably fails to look into a mirror. Whatever one want to call it, evaluation or judgement it was still an invasion from the Europeans into the lands of the Native Americans. If it was not an invasion then we must rename all other invasions in history to. Maybe Hitlers invasion of the Soviet was just an exploratory expedition? To blame all on Pinochet is to turn a blind eye to the actual historical and social forces in tension within Chile and its institutions. Similarly, to call the advent of the European onto the Western Hemisphere, an invasion and an act of robbery, says nothing of the forces and institution at play nor can explain the true roots of American hemispheric identity. It may make some fell good but such verbiage carries nothing of relevance, specially if one wishes to understand the distinct differences in the societies that now constitute the Americas. The "pronunciamiento"... (what a stupid word to describe it) was the work of a bunch of thugs supported by the right wing and also corrupted Nixon administration. They controlled the navy and the army, and from there they controlled the country. It was very unfortunate for us that our military institutions became involved in such low affairs, and it has cost us three decades of cleaning to make them be just a bit as brilliant as they once were. But we have it very clear. Those mafiosi that took power doesn't represent Chile not the armed forced. Even more, with time the shadows of the victions, like General Prat, will left in darkness the memory of those bloody idiots. Egyptians erased the memory of the bad Pharaons. The same will happen in this case here.